How do artists effectively relate historic events? Classroom teacher with opportunities for collaboration with visual arts teachers. Through teacher-guided discussions and hands-on activities, students will understand the political and economic reasons for the African-American migration to Northern cities between the World Wars. They will discover the similarities and/or differences of life experiences in the South and the North through research, photographs, and artwork, as well as examine how these changes affected African-American life. This lesson was written to complement and enhance the Scholastic Book, Color Me Dark and subsequent production staged and produced by the Kennedy Center. This lesson also stands individually and may be taught without referencing the book or the play. Test internet connection or print copies of the images which will be used. ELL students should be encouraged to reference artists from their native countries who depict history in their art. 1. Introduce the topic of the Great Migration by presenting a photograph of the migration of an African-American family. Elicit observations from students about the photograph (e.g., African-American family, traveling by car, moving somewhere due to the suitcases on top of the car, looks like they are in the country, etc.). Tell the students that this photograph was taken in the 1900s. Ask the students why they think this family might be moving and list responses. (e.g., find a better home, new job, better life, etc.). Write responses on the board. 2. Ask students if they know another word that can be used to describe the movement of people from one place to another. Write the word "migration" on the board. Explain to the students that from 1900 to 1920 large numbers of African-Americans migrated/moved to northern cities. This time was referred to as "The Great Migration." Explain to the students that there were many reasons for this move. Make references to the chart you created earlier. 3. Write the word "segregate" on the board and explain its definition. Segregate: (verb) to separate or keep people or things apart from the main group. 4. Discuss that African-Americans were separated from whites, and that in the South, schools, hotels, restaurants, and other public places were segregated. African-Americans were not allowed to vote and were excluded from many job opportunities because of the color of their skin, so they wanted to move to a place where life would be better for them. 5. 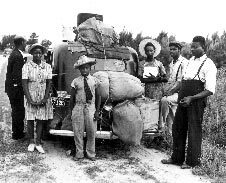 Tell the students that they are going to find out where African-Americans moved and where they came from during the Great Migration. 6. Divide students into small groups. Present each group with a map of the United States. An easy-to-use map can be printed from the National Geographic. 7. Have students title the map: "The Great Migration Routes of African-Americans 1900s." 9. Have students choose two different color crayons or markers. Have them locate the states in the first column and color them one color; do the same in another color for the states in the second column. 10. On the board review directionality: north, south, east, and west. Ask students to determine the direction from which African-Americans started to migrate. Responses should be south/southeast to north/northeast. Students can then color in all the other states on the map a third color. This will clearly indicate in which areas African-Americans lived and where they migrated. 11. Tell students that African-Americans generally migrated northward in two distinct patterns. One group of migrants - originally from Louisiana, Mississippi, and Arkansas - followed the Mississippi River north and landed in such cities as Chicago, Illinois; Detroit, Michigan; and Gary, Indiana. Have students write the names of these cities on the map. The other group of migrants - predominantly from Georgia, Alabama, South Carolina, and Florida - traveled east, moving northward along the railroad lines of the Atlantic Coast. They settled in such cities as New York, New York, and Philadelphia, Pennsylvania. Again, have students label the cities on the respective states. When the students have finished have them draw lines to show the two migration routes that were just discussed. 1. Have students take out their maps of the United States from the previous lesson and review the migration patterns of Africans-Americans from the South to the North during the 1900s. Urban: (adjective) of or relating to a city, city people, or city life. 3. Add the words "country" below "rural" and "city" below "urban". 5. Tell students that they are going to study photographs to see how life in the rural South for African-Americans was very different from life in the northern urban centers. Also explain to students that southern states are not all "rural" and northern states are not all "urban," but that you are specifically talking about rural parts of southern states and urban centers of northern states. Remind students of the definitions of rural and urban when making a determination of an area. 6. Divide students into small groups and provide each group with a pair of photographs from the handouts. As you distribute them, explain to students that these photographs will show African-Americans in the rural South and in northern cities. Some photos will be homes, schools, churches, etc. 7. Distribute writing paper to students. Tell them to look carefully at the pair of pictures; compare them by discussing with the group and writing in the similarities and differences. Have them ready to identify which picture represents rural life and which picture represents urban life. Ask each group to present their findings orally. To solidify their understanding of the similarities and differences, each student will summarize the similarities and differences between rural and urban life on the downloadable Venn Diagram located within the Resource Carousel. 1. Review with students the reasons for the Great Migration of African-Americans during the 1900s. (Lack of job opportunities, segregation, wanting a better life and better education, etc.) You can reference the chart that was made with the class earlier in the lesson. 2. Ask students: How do we learn about important historical events? (Through written work, textbooks in school, books in a library, etc.) Ask if important historical events can be presented in another form besides the written word. Explain that artwork such as paintings or sculptures can represent an important historical event. 3. Show students the painting George Washington Crossing the Delaware, 1851 which hangs in the Metropolitan Museum of Art. Read aloud or have a student read the description of the painting. Tell students that certain painters/artists sometimes would portray important events or choose an event or issue they felt strongly about and portray it in their art. 4. Tell the students that they are going to view the works of two well-known African-American artists who used their artistic talents to express the experience of African-Americans. Point out that these artists painted most of their works in the mid-1900s, after the most intense period of the Great Migration, but that their works reflect the rural and urban lives of African-Americans. The artists' names are Jacob Lawrence and Ellis Wilson. (Write their names on the chalkboard or chart.) Tell the students that they are going to look at how these artists' work represents rural and urban life of African-Americans. 5. Distribute the Student Reference Sheet located within the Resource Carousel and go over the artists’ background information. Tell students that they are going to begin with Jacob Lawrence's work. Go to the interactive Jacob Lawrence: Exploring Stories web site of the Whitney Museum. They should follow the directions on the reference sheet. Next, display Ellis Wilson's rural paintings. Once again, have students follow the directions on the reference sheet. 6. Ask students to write a thoughtful paragraph about which painting they liked best and why. 1. Ask students to recall how Jacob Lawrence and Ellis Wilson depicted events in history. Remind students of the similarities and differences they saw in the photographs and discuss (e.g., homes and schools in the South were in poor condition, schools and homes in the North were generally in better condition). 3. Give squares of colored construction paper-measuring 12" x 12" or larger-to each student or each group of students for their background. Students will cut out shapes from construction paper or any other material you would like them to use to depict their representation of an aspect of the Great Migration. Students will glue these shapes to their colored construction paper. Some students may prefer to paint right on the square. Give students freedom in the way they wish to use the materials. 4. Have students present their artwork to the class. Collect the panels and put them together to create a wall hanging. Assess your student's work using the Visual Arts Assessment Rubric and the Venn Diagram Assessment Rubric located within the Resource Carousel.